What’s the one thing that keeps you up at night? Terrorist attacks? Makes sense. Research shows although deaths fell overall from 2014-2015, many countries experienced record levels of terrorism in that period. Natural disasters? With the changes being brought on by global warming, earthquakes, storms and other extreme weather events are on the rise , so you’d be right to worry. But while these fears are understandable, they might not be the biggest risks, at least in the short term. In the US, for example, you’re more likely to be fatally crushed by furniture than killed by a terrorist. 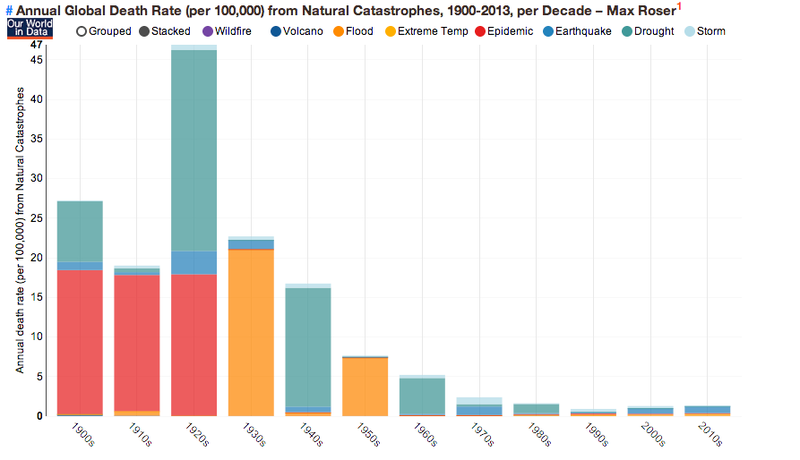 And while natural catastrophes can be devastating, you’re actually less likely to die in one than ever before. He has reiterated this warning in December 2016, telling BBC Radio 4 that the world would be vulnerable to a deadly flu epidemic. At the end of 2013, a two-year old boy from a rainforest village in southern Guinea contracted a virus few had heard of and died shortly after. What started off as a personal tragedy quickly took on a global scale, as an Ebola epidemic spread across three countries in West Africa. By the time Liberia was declared Ebola-free in January 2016, more than 11,300 people were dead . No sooner had the world stopped panicking about an Ebola epidemic, another was making headlines: Zika, a virus spread through mosquito bites that has been linked to serious birth defects. So far, countries across Latin America – Brazil and Colombia in particular – have been the worst hit. But in February 2016, the World Health Organization declared a public health emergency , warning that up to 4 million people could be affected over the coming years. Since then the virus has been detected across the world. Countries from the US to Singapore have reported cases. This map shows reported cases as of 9 January 2017. For all the progress we’ve made towards eradicating some of the deadliest and previously widespread diseases – smallpox, soon polio and maybe measles – pandemics and epidemics still pose one of the biggest threats to international security, and new threats seem to pop up every couple of years. In fact, if anything, the risks keep growing. In war-torn countries like Syria – where 95% of doctors have fled, been detained or killed – health services have been devastated: “All the risk factors that enhance the transmission of communicable diseases in emergencies are present in the current crisis in Syria and its neighbouring countries,” one WHO representative warned . Climate change could also be amplifying risks, the WHO says : “Changes in infectious disease transmission are a likely major consequence of climate change,” and could trigger an increase of diseases transmitted by insects and waterborne infections. Even the growing terrorist threat could create public health crises on a huge scale: “Advances in biotechnology have brought a wide range of benefits in health and medical research, food and agriculture. But it has a darker side, as biological weapons are now within the reach of many rogue nations and possibly some terrorist groups,” Daniel Gerstein of the RAND Corporation cautioned in 2016. It’s not just the scale of the threat that has people worried, although that is scary enough. In the 14th century, the Black Death killed around 60% of Europe’s population . The 1918-1919 influenza pandemic killed around 40 million people , making it deadlier than the Great War. Even more worrying, though, are the potential knock-on effects that could threaten global stability: “Epidemics and pandemics can have enormous human tolls. But the social, economic and political consequences can be just as devastating. Take the example of Ebola: some estimate it could end up costing West Africa as much as $15 billion over the next couple of years in lost investment, trade and tourism. There’s no telling the instability this might cause long after the immediate threat is over,” points out Anja Kaspersen, who leads the Forum's work on international security. Back in September 2014, at the height of the epidemic, the UN Security Council even went as far as to declare it a “threat to international peace and security”. It was the first time the council had met to confront a public health crisis and is evidence of how seriously some international security experts are now taking public health crises. So how do we deal with this growing threat to international security? “The best defence is being prepared,” last month’s Munich Security Report recommended. And that’s the problem: we’re not prepared. "Traditional preparedness and response measures have proven to be insufficient; mitigating the risk of outbreaks requires novel approaches and cross-sectoral solutions," says Vanessa Candeias, who heads up the Forum's global challenge on health. The Coalition for Epidemic Preparedness Innovations (CEPI) took part in the World Economic Forum’s Annual Meeting 2017. You can watch their session here .